Klemens Fellner - Fellner, Klemens, Univ.-Prof. Dipl.-Ing. Dr.techn. 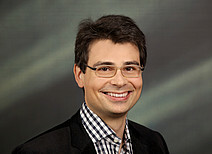 Klemens Fellner is professor of Mathematics/Computational Sciences and group leader at the Institute of Mathematics and Scientific Computing, University of Graz. The research of the work group "Analysis" focuses on the analysis of partial differential equations and on the mathematical modelling of various applicational backgrounds from physics, (bio-)chemistry and (cell-)biology. Mathematical modelling, Organic photovotaics, Swimming micro-organism, Collective behaviour, Protein localisation, Stem-cell division, Mathematics & Arts.